Today’s rainy summer day started with an amble down Oxford Street. The street of myriad shops, frenzied tourists getting in their retail therapy and streams of London buses slowly making their way. I love a bit of time in Oxford Street, but a word of advice – go in the morning – by afternoon it can get unpleasantly packed. On one of my first meanders down Oxford Street I was surprised that I couldn’t find one of those famous London pubs I’d read so much about. I was too nervous to go off the main drag in case of getting lost! In fact there is one pub on the street which is right near Tottenham Court Road tube station. It used to be called The Tottenham but has recently been renamed The Flying Horse. Not sure why. But of course if you step down any of the side streets off this great London thoroughfare there’s no shortage of pubs, bars, cafes and restaurants to enjoy. And as London’s restaurant scene gives you the opportunity to enjoy the whole world’s cuisine, just a hop and a skip off Oxford Street is Busaba where you can tuck into the flavours of modern Bangkok. It’s a beautiful, contemporary space with large tables and benches for convivial sharing. 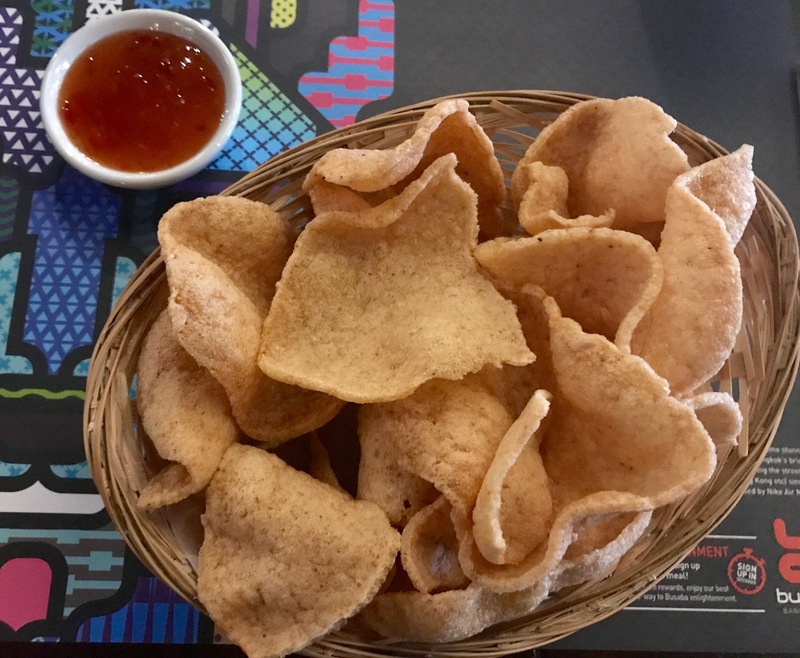 We tucked into some tasty, crunchy prawn crackers served with sweet chilli sauce while we pondered the comprehensive menu. 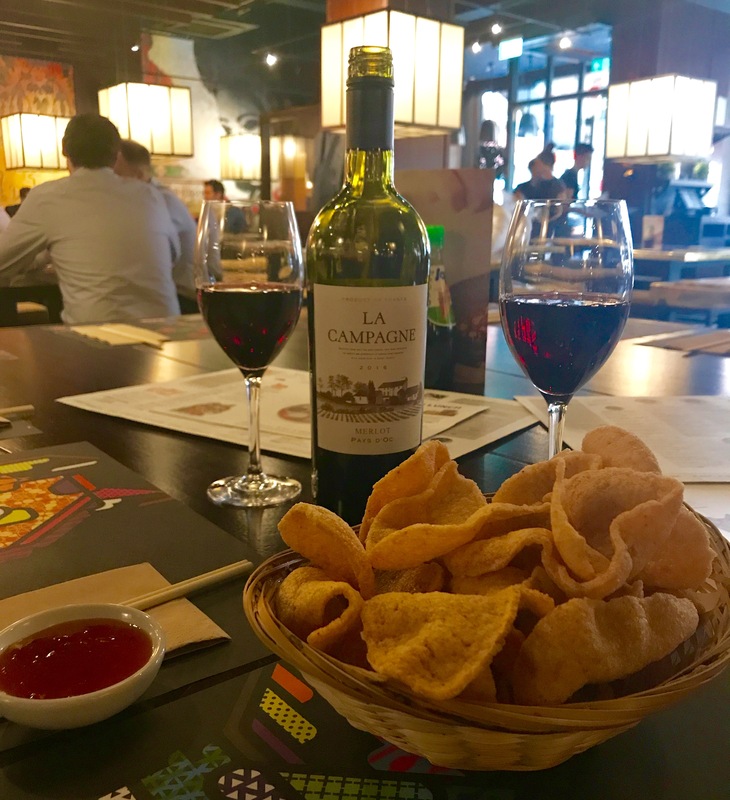 There are several sections to consider – snacks, small plates, stir fry, wok noodle, curry, chargrill, soup and salad – and everything sounded delicious. A hard place to make choices but it had to be done. 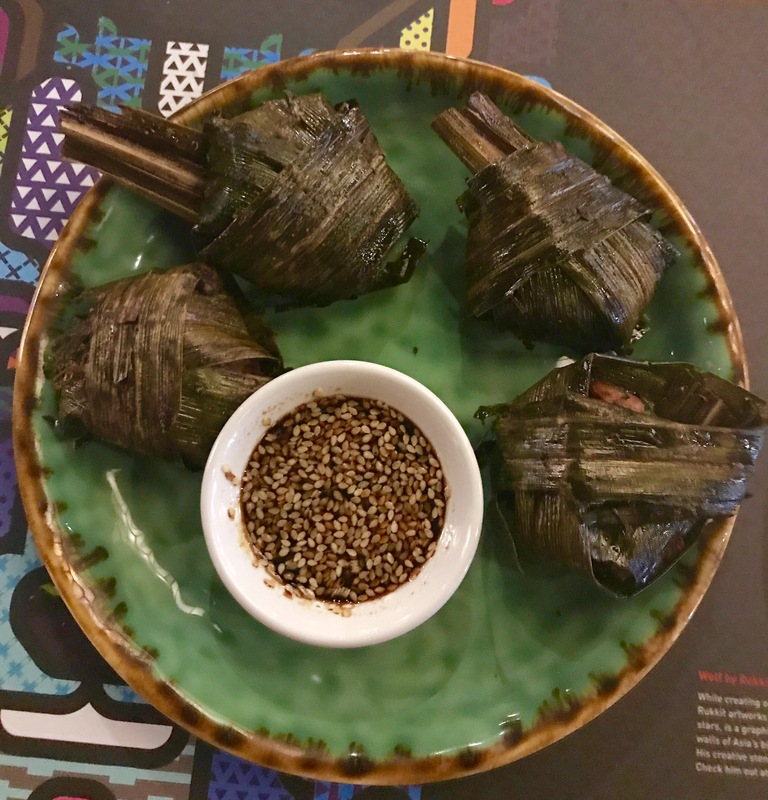 We started with the Pandan chicken – tender, fried chicken pieces wrapped in pandan leaves and served with dark soya and sesame dipping sauce. 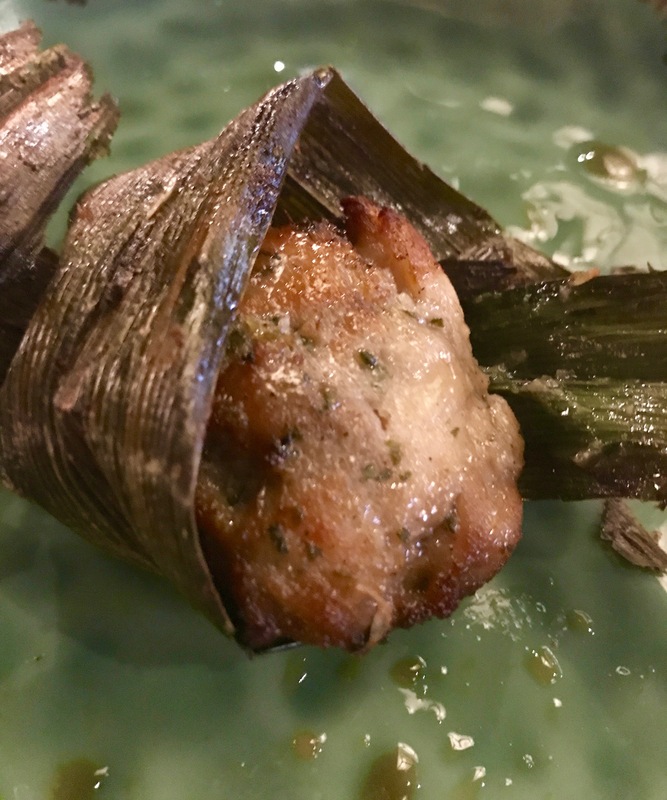 It’s amazing just how tender and flavoursome this chicken was – and I do love the pandan leaf idea, it’s like unwrapping a gift. A very tasty one, too. 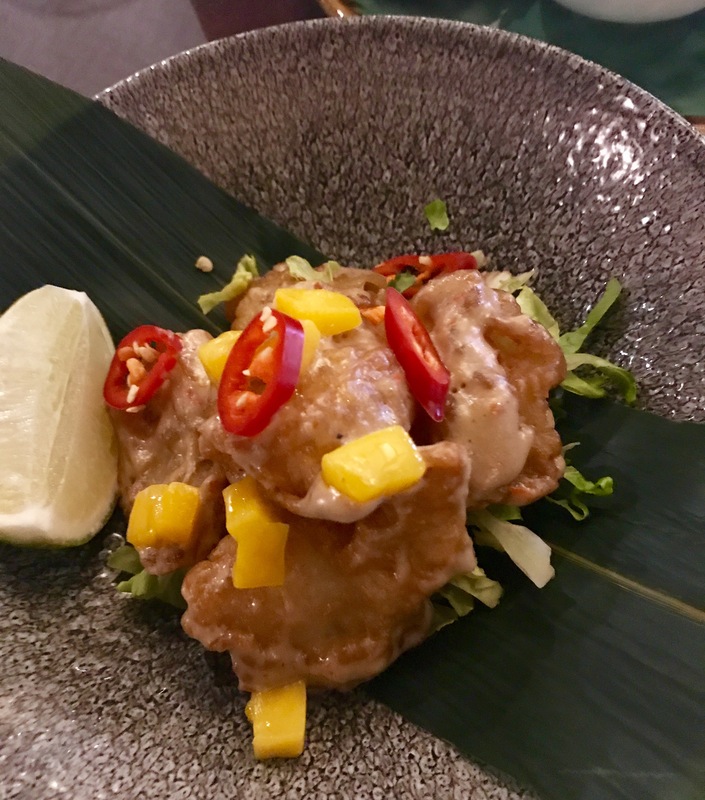 A different take on prawn tempura – where the prawns are tossed in Thai-seasoned mayo and topped with chopped mango and chilli. 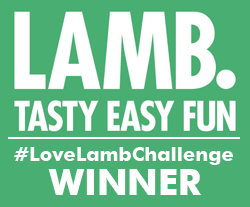 A wonderful combo of textures and flavours with quite a serious chilli bite. From the stir-fry section we chose the ginger beef. 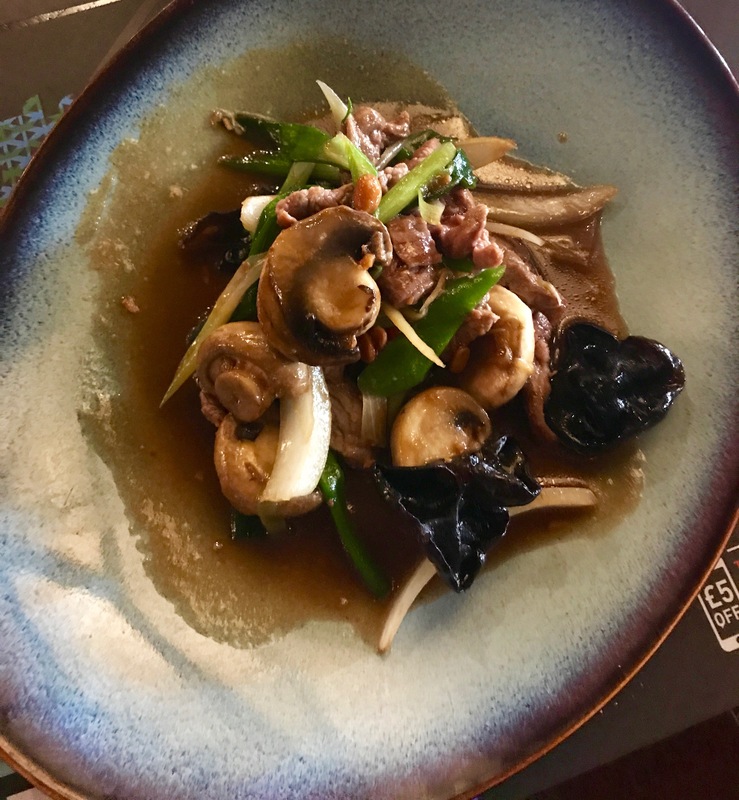 Strips of bavette in garlic and ginger sauce with mushroom, Thai pepper, fresh chilli and spring onion. The beef was lovely and tender and the sauce packed plenty of gingery flavours. I do love a Thai curry. 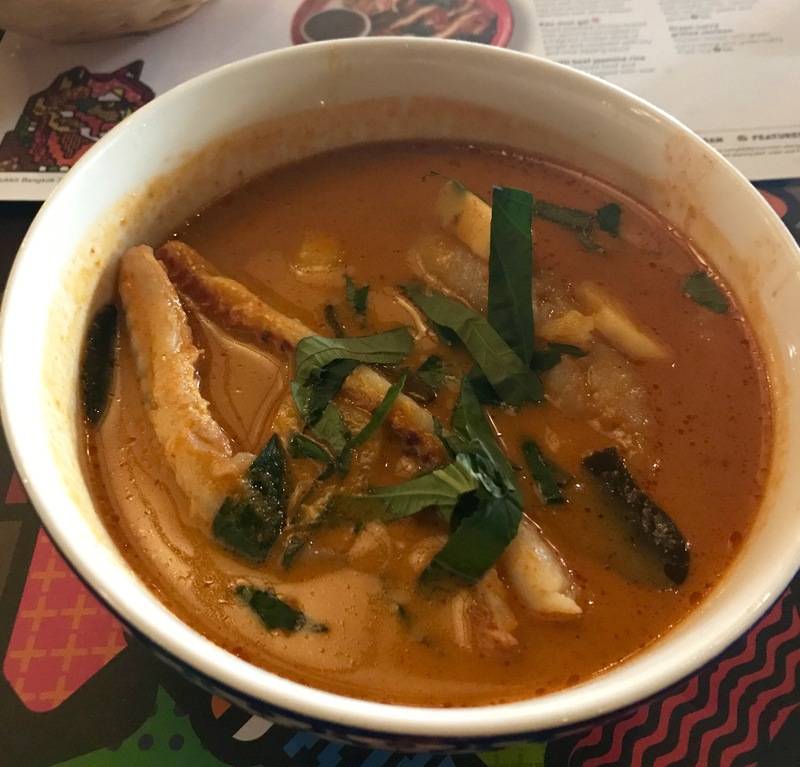 Today’s was one with a difference – red mullet, pineapple and betal leaf -with the fillets poached in the light red coconut milk curry. Mullet is so sweet and tender and goes perfectly with this creamy sauce. 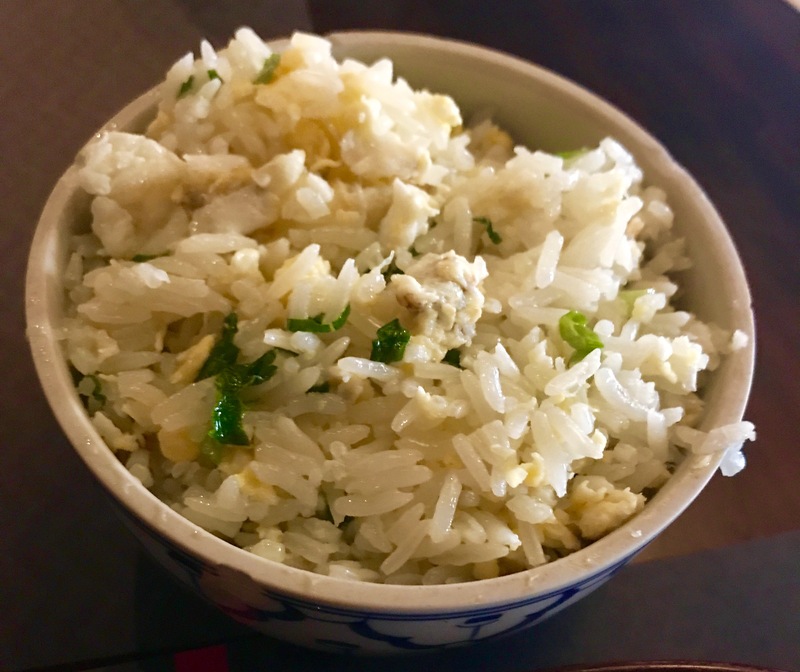 We enjoyed our mains with a fluffy portion of egg fried rice. As a regular consumer of Thai food I was happy to discover that the menu offered some interestingly different dishes. And there’s a vast selection of Asian beers and Thai spirits – perfect for cocktails. I didn’t get round to any cocktail sampling this time around, think I’ll have to go back for a refreshing guava bellini or how about an Asian mojito with kaffir lime leaves? Yes please. To finish off, here’s a shot of the stylish room through our delicious wine. Why not? Our two courses cost £38 without drinks or service. Wine starts from £17 a bottle. Cocktails are £7.50 and there’s a wide range of fresh juices starting from £2.50. Busaba is at 52-53 Eastcastle Street W1, just off Oxford Street. Oxford Circus tube station is a few minutes walk. There are twelve branches across London, so there’s bound to be one near you.